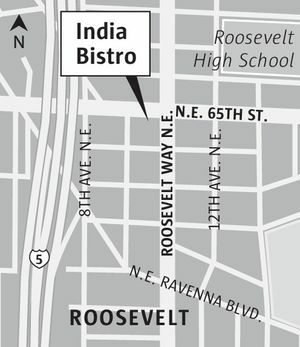 India Bistro offers savory food at reasonable prices (even the lamb dishes) in the Roosevelt district. Indian food is one of the last refuges for very budget-minded diners seeking a good meal in a pleasant sit-down eatery. Even in curry emporiums the prices are rising. But one of the better deals around is still India Bistro, a quiet spot tucked into a busy corner. This sister to Ballard’s India Bistro serves staples of Indian fare — curries, tandooris, etc. But with no sacrifice of quality or portion size, entrees are often a few bucks less than the competition’s. India Bistro also has an enticing daily lunch buffet ($8.95) and a Monday-Saturday happy hour (4-6 p.m.), as well as a Sunday-Monday dinner buffet ($12.95). The menu: Well-balanced, aromatic spicing, fresh ingredients and a judicious use of thickeners like cream and yogurt give the filling North Indian cuisine a welcome lighter touch. One big attraction: the generous array of lamb dishes, from lamb roghan josh, tender lamb simmered with tomatoes, with ginger and yogurt ($12.95), to a juicy Australian rack of lamb with garlic sauce ($18.95). Savory, reasonably priced seafood offerings include jheenga saag ($13.95), mating plump shrimp with puréed spiced spinach and sizzling platters of fare from the tandoori oven. Available alongside the baked naan and roti is kulcha, another unleavened bread stuffed with onions or potatoes. What to write home about: As fans of biryani — the delicious saffron rice dish mingling nuts, currants and veggies — we delighted in the India bistro version ($10.95-$13.95, with lamb, chicken, shrimp or vegetables). What to skip, or fix: The tandoori meats were a tad dry but helped by applications of a tasty citrus sauce, served on the side. The setting: An attractive room, attentive service and nice natural light on the Northeast 65th Street side. Summing up: An order each of lamb rogan josh ($12.95), a mixed tandoori platter of chicken, lamb and shrimp ($16.95), and vegetable biryani ($10.95) fed three very well, and came to $40.85 before tax and tip.